You are here: Home » You All Rock! We had an outstanding first day in our fundraising campaign for the refugee aid organization International Rescue Committee. In just 24 hours we raised $950, nearly half of our $2,000 goal. We wanted to take this opportunity to say Thank You to everyone who has participated so far. And yet, as good as it feels to say “we’re half way there” it’s sobering to know we still need twice as many contributions to hit our target. 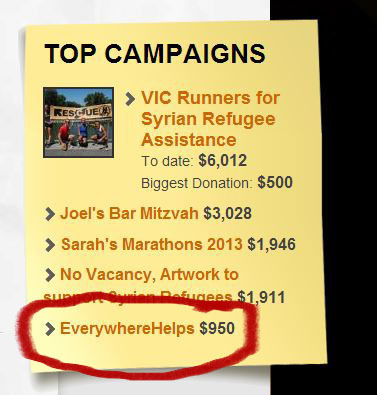 The IRC really is a great charity whose work is sorely needed in places like Syria. So if you haven’t yet given, please consider making a donation. And if you can’t give, please help us spread the word on your own blogs and social media outlets. Fun fact: The IRC was founded in 1933 at the suggestion of Albert Einstein to assist Germans suffering under Hitler. I am planning to donate to UNHCR, but IRC seems like a good organisation too. Do you have any thoughts on the pros/cons of these two? As far as I know UNHCR is a good organization as well, although I haven’t really researched them.